ATRA is a leading Bulgarian manufacturer of electrical materials and lighting solutions. The main categories the company offers are garden and decoration lighting, bathroom lighting, electrical materials, LED lighting and many others. The company has ISO 9001 and developed international markets in Eastern Europe and Russia. 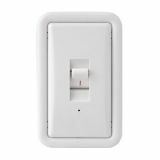 Water heater switch, 25A, 250VAC, flush mounting, white, 4131, ATRA Single electric switch for water heater ATRA in white color designed for flush mounting 25A, 230 VAC. Suitable for residential and office areas. Made in Bulgaria. List Price 11.50лв. VAT Incl. 10.92лв. VAT Incl. Water heater switch (2x switches+1x socket), 25A , 250VAC, flush mounting, white, Labeo, 4233, ATRA White, triple combination water heater switch 25A Labeo from ATRA - 2x switches and 1x earthed socket (2P+E, schuko). Suitable for residential and office buildings. Made in Bulgaria. Water heater electric switch, 1 switch +1 socket, 25A + 16V , 250VAC, flush mounting, white, 4132, ATRA White electric water heater switch combination with socket (1x switch + 1x socket schuko) in white color designed for flush mounting. Suitable for residential and business buildings. Made in Bulgaria. List Price 15.50лв. VAT Incl. 14.72лв. VAT Incl. Water heater switch, single, 25A, 250VAC, white, surface mounting, white, Labeo, 4234, ATRA White, single water heater switch 25A Labeo from ATRA designed for surface installation. Suitable for residential and office areas. Made in Bulgaria. 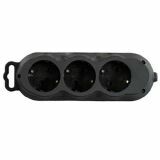 Three-way power plug 1xSchuko to 3xSchuko, 250VAC, 16A, white, 7132, ATRA 3-way power socket plug adapter in white color from ATRA, 1 to 3 schuko with rated voltage of each socket 250VAC and rated current 16A (3x 16A). Made of PVC in Bulgaria. List Price 7.90лв. VAT Incl. 7.50лв. VAT Incl. 6.21лв. VAT Incl. 3-way Extension socket without cable, 250VAC, 16A, white, cylindrical, 7133, ATRA Outlet Power Strip without cable with 3 sockets, 250 VAC, 16 A, white, semi-cylindrical shape and schuko configuration. 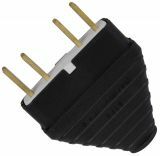 Socket, ATRA, surface mounting, 90°, 250VAC, 16A, white Electrical outlet with one socket for surface mounting with rated voltage 250 VAC and rated current 16 A.
Socket unit, 1x3-phase+2xSchuco, 16/25A, 250/400VAC, gray Mobile socket body, three-phase module with a 3-phase outlet and 2 single-phase outlets Shuko. Cable outlet, surface mounting, ф14mm white Cable outlet for surface mounting for cables with overall diameter of 14 mm. 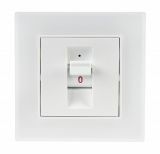 Electrical socket, two outlets, 230VAC, 16A, white Panel electrical socket with two outlets with rated voltage of 230 VAC and rated current of 16 A. The outlet body is white .